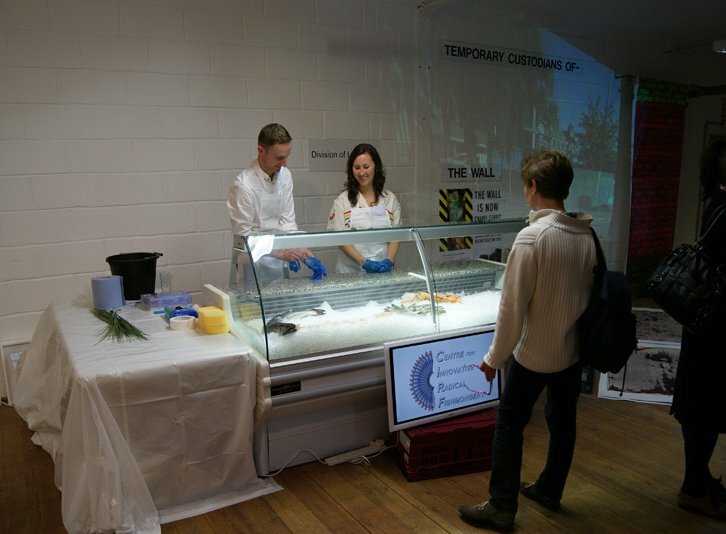 CIRF presented a fully functioning fish counter at Sluice Art Fair to present an ever-changing display of fresh fish and seafood. 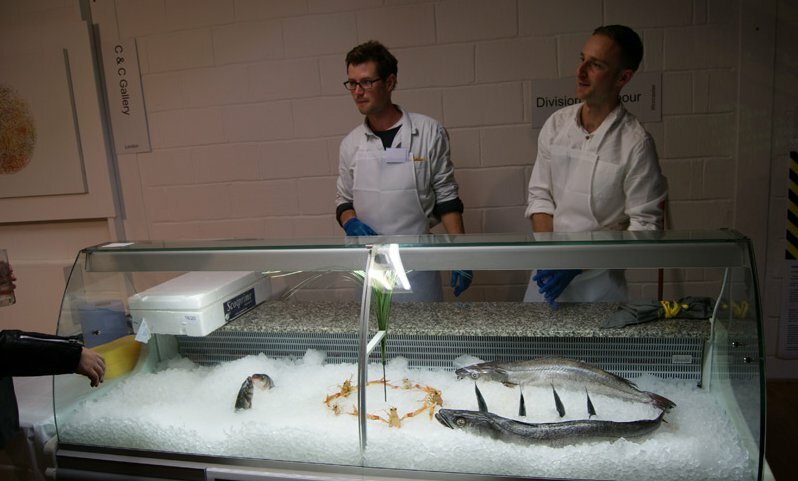 CIRF invited a range of visiting artists to create their own displays and re-think their own practices through the medium of fish arranging. CIRF was supported by Division of Labour who funded and helped run the counter. 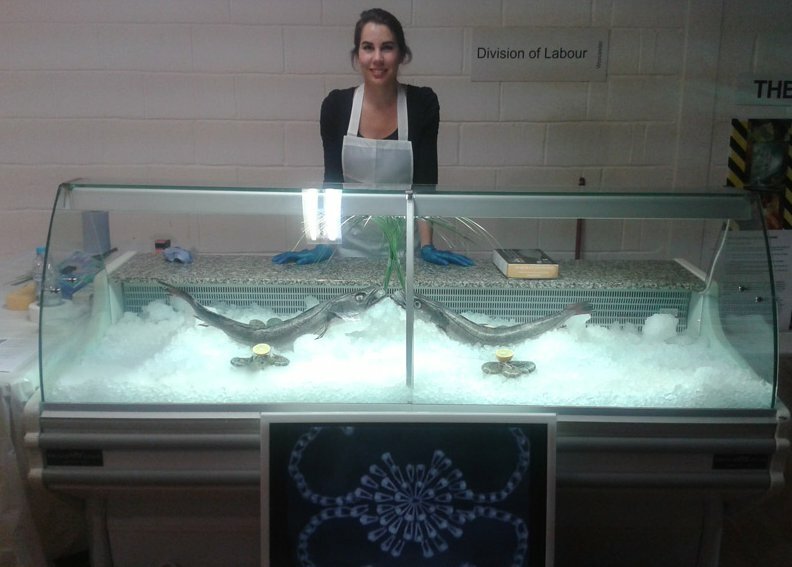 CIRF launched a new innovation in fish display at Sluice Art Fair, the use of correlating video with the fish display. Artist Sam Curtis created a video based on repeating imagery, factory processes, choreography and the power of the mnay all moving in one direction. 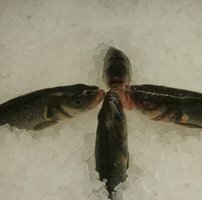 This is the first time video art has been used to enhance a fish display and it worked to good effect with many visitors standing mesmerised at the counter. 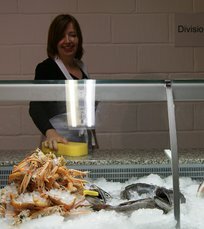 jumped at the chance to try her hand at fish display and attacked the fish counter with energy. 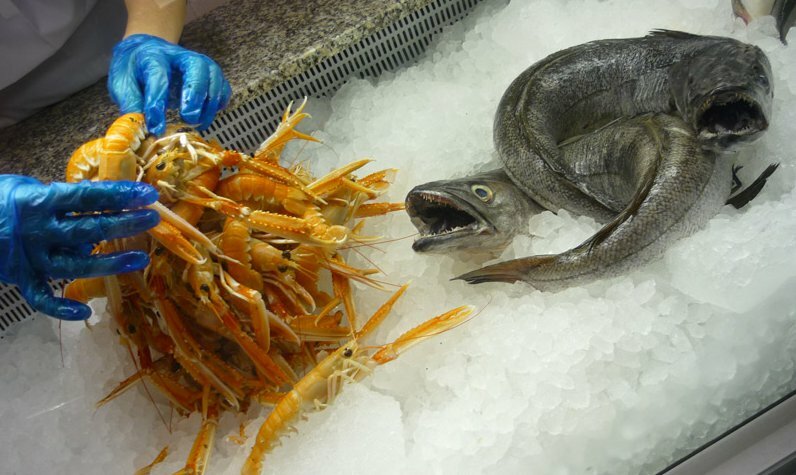 Her display developed to include a narrative involving hake chasing a shoal of sardines. 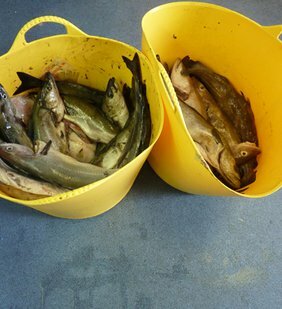 an artist working at CAFF, very quickly worked up his display that utilised the 'less is more' approach. 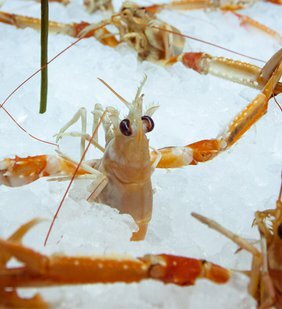 His ring of Langoustine all holding claws was a real hit. 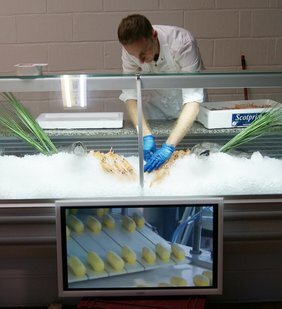 Partly inspired by the Busby Berkley musicals from the CIRF video, this method of displaying langoustine inspired many more displays throughout the event. Jean Baynham is an artist that works between art and science. Her display for CIRF was like nothing we had seen before. A scambling pile of Langoustine, delicately balanced, pair of tightly intertwined Hake and a tight ball of sea bass with no head's showing. Jean's own sculptural work is inspired by science and nature's patterns and structures. Celine Condorelli worked with Nathaniel Pitt to create this swarm of Langoustine spilling through a deep valley of ice. Berta De La Rosa was another artist from CAFF and she followed rules of symmetry whilst developing her display. The use of curved, kissing Hake here made for an impressive display.